Shopify provide very easy-to-use DIY platform for all your eCommerce needs. To change the Store name, one needs to purchase a new domain name. It is the new Shopify store name address (URL) which you want your customers to use while visiting your Shopify store on the Internet. Once you purchase a new Domain you need to add it to your Shopify web store. Select Next button to complete the first step. Now you need to update the CNAME record of Shopify to the newly purchased new domain. 2) Search for DNS settings. 4) Now, you need to add CNAME for pointing it to Shopify. Congratulations! CNAME record added successfully. Once you have added CNAME record successfully, you can proceed for verifying your new domain for your Shopify store. 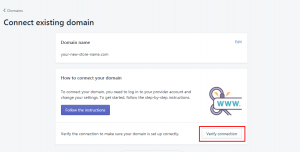 Choose Verify connection to confirm the new domain connection in your Shopify admin panel. It could take up to 48 hours for your new domain to point your Shopify store. 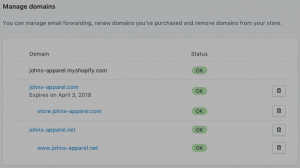 Once your newly added Domain is successfully verified and pointing to your Shopify store, you need to set the new domain as a primary domain in your Shopify admin panel. Navigate to Domains section in your Shopify admin panel. Choose the new domain from Primary domain drop-down menu from the Set your primary domain section. This video talks about why it’s important to buy your own domains name, what kind of language you need to understand, and what settings to configure with a third-party provider.